This article was posted on 14th February 2013. We had thought our new Delphine pieces were the most femininely pretty of our French Style Furniture collections, but our new Provencal Sassy White French Bed is truly enchanting with its detailing - shell-like carvings and acanthus leaves that adorn the edges of the headboard and footboard and the scrolling cabriole legs (all are beautifully carved by hand from mahogany) - and its finish - in a classic distressed antique white. It's effortless luxe with the charm and lasting appeal of an heirloom piece! You'll notice a rather beautiful wallpaper in some of our new shots - that'll be Josette in Dove Grey by Laura Ashley - classic, timeless and truly elegant. Wherever you hang this paper - whether it's to line the drawers on a French chest of drawers, decorate the interior of a wire-fronted French armoire, or if you want to indulge in papering a whole room in its subtle smoky grey tones, it will effortlessly instil a touch of Parisian apartment chic into whatever style of home you have. 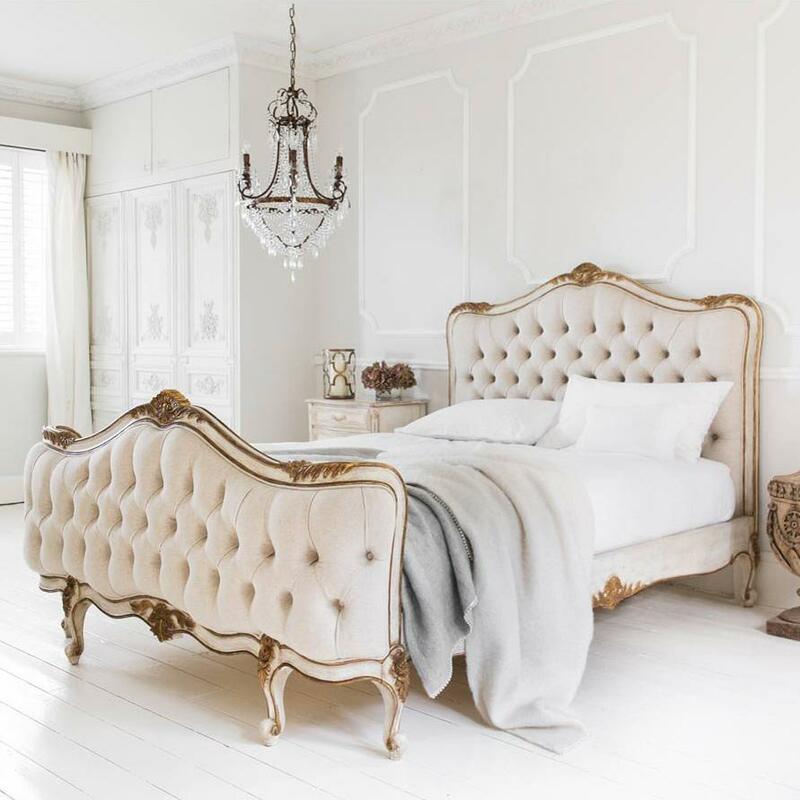 Once you have the romantic French Bed and the dreamy wallpaper, it's time to introduce sensual and luxurious materials and textures - from the glistening cut glass base of our Daphne Table Lamp base to the silken soft mohair-like strokability of our Axelle's Pretty Throw. As with any new scheme, don’t immediately fill it with accessories all at once - leave room for your taste and scheme to mature over time, adding in real slices of Parisian living, whether it's some stunning fragranced candles from a visit to a Parisian boutique to some vintage apothecary jars for your French dressing table. One of our new pieces - the Diana Bust, is a bit of a cheat piece - it looks as though you've bought it at an auction or French flea, but actually it's a reproduction from us! Oh, and don't forget the flowers - a bunch or even a stem or two of freshly-cut flowers are the epitome of indulgence sometimes - it's so worth the effort! Another new favourite for you if you've not already seen it is our newly-launched Pearly Queen Throw - if you feel as though your Valentines flowers (or lack of) weren’t quite the treat you really feel you deserve, this beauty of a throw in soft wool and trimmed with rows of pearls, might just be the lunchtime purchase you were looking for!